Seriously what is up with some of these captcha words I am getting? I am not trying to break into a secure website. I just want to post a snarky comment or buy some concert tickets. For the love of fat bassets, I feel like I need an effin' degree in hieroglyphics to decipher some of the words I have been given. Five years ago I was meeting a Playmate of the Year at a strip (or peeler bar for my Canadian friends) club with some friends, and now I am meeting Kyle's preschool teacher. Oh how my life has changed. But you know what? I would not change one thing. I am a lucky guy and grateful for my life, wife, and kids. Kyle got into an awesome preschool that meets twice a week for 2 hours a day, and it is the one we wanted to get him into the whole time. The only drawback is the session he got into starts at 12:45 which is usually nap time so we might have a Stage 5 crankasaurus for a few weeks until he is acclimated to the new schedule. What is that you say? What about Little Miss Hayden? Well she has about 4 teeth coming in at the same time. Guess what that equals? One unhappy baby. She is being a trooper but the poor little lady is not a happy camper. I also thought the dude in a wedding dress was a nice segue to my anniversary My wife and I will be celebrating 8 years of wedded bliss next month and we are enjoying ourselves by going to Vegas. The traditional wedding gift for this time frame is bronze so I figured I would take the lovely Mrs. Shife to place where she work on her tan and I can play penny slots since that is all I can afford with 2 kids. I hope everyone has a great Labor Day weekend, and thanks for stopping by. Enjoyed this post, Matt. Please give Hayden a remedial kiss from me... four teeth at once is a bit over the top for the poor mite. Kyle will soon settle into his new regime.... trust me on this... grins. I'm so with you on the captcha thingy... sometimes I have to abandon a comment because I can't read the damn thing. 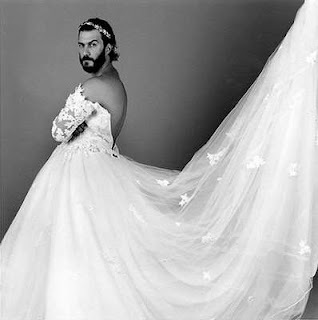 By the way, I loved the guy in the wedding gown!!! Sunny Vegas eh? What a great way to spend your anniversary. I agree on the captcha; sometimes I'm doubtful such words even exist. Sorry for not dropping in here last week. That whole "being sick" thing took a priority. Sorry, that dude in a dress will just not do it. I'm with you on the captcha, sometimes I refresh over and over just trying to get one I can read. Good post today. My wife and I celebrated 8 years of wedded bliss on our 29th anniversary. I actually thought you were going to say that the Playmate of the Year turned out to be Kyle's preschool teacher. Have fun in Vegas, but don't wake up with a face tattoo and missing teeth. man, it's pretty hard to follow tex's 8 years of bliss comment. i'll never figure out why people activate those totally unreadable words. Preschool time! Kyle will LOVE it. With the whole teething thing, not much you can do. Just wipe up the drool.